This is one of those Snarkies were I considered many different punchlines. Usually that happens because it's based on a real event, and I'm quietly telling myself at the time to shut up and not say all the things popping into my head. No good can come from being snarky with a customer, unless the good is to lose the customer or your job. Fortunately, I suspect only one of the customers I work with is capable of reading minds and she's an internal product owner, so I'll just get a squint, a shake of the head, and then a raised eyebrow or soft snort. I heard, "yada yada yada COM...yada yada I'm a GenX manager." Your macros should be put to REST. If it was an add-in, that means it can be a take-out. 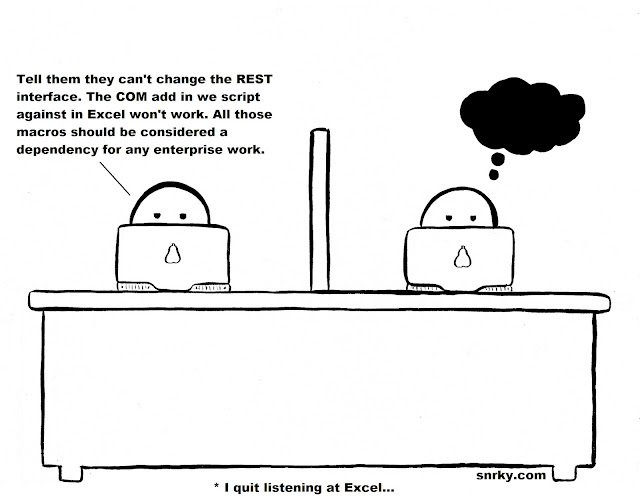 Snarky: Tell them they can't change the REST interface. The COM add in we script against in Excel won't work. All those macros should be considered a dependency for any enterprise work.